Single Use is the Collin’s Dictionary Word of the Year for 2018. By definition, ‘single use’ means to be used only one time. The Collins Dictionary team explained how use of the term ‘single use’ has grown substantially since 2013 as the effects of pollution have become so widespread that they appear in every day conversations and in politics. Single use typically refers to disposable plastic products intended for single use by an individual consumer. It is a term today that immediately evokes images of waste in the ocean, because the proliferation of waste caused by these items is known to damage the environment and also affect the food chain. The harm that the disposal of these products can cause on the environment, has not gone unnoticed. This awareness has grown through movies such as BBC’s One Planet narrated by Sir David Attenborough. Increasingly, the public has shown concern, leading to action by local, state and federal authorities in different parts of the world. Over one million plastic bags are used per minute, according to data collected by Plastic Oceans, a non-profit consumer organization. 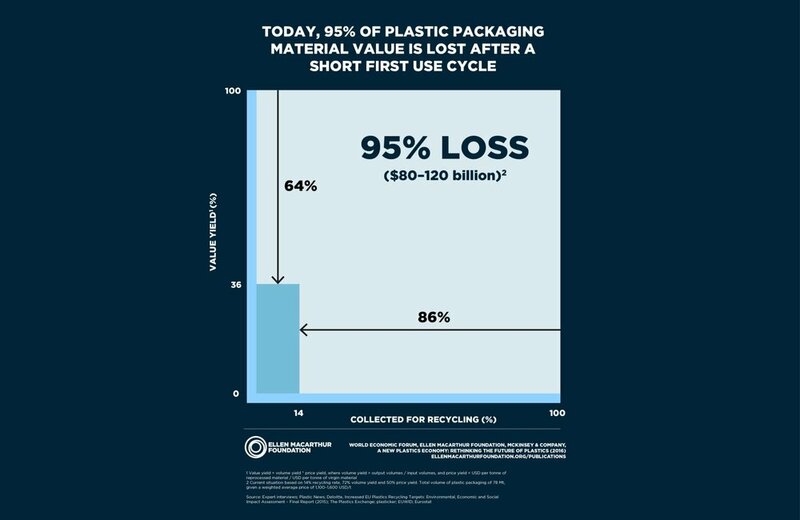 40 percent of all plastic produced is for packaging. A single plastic bag only has a ‘working’ life of 15 minutes. Today human beings across the globe produce nearly 300 million tons of plastic every year, half of which is for single use. More than 8 million tons of plastic is dumped into our oceans every year. How Does Plastic End up in the Oceans? The answer is simple. Gutters and storm drains all lead to the ocean. Waste dumped in lots, eventually seeps into ocean waters. In some communities, plastics and other waste are even directly dumped right on beaches. Plastic straws for instance, end up in the ocean through human error, left on beaches in resorts and vacation areas, littering and blown out of trash cans and boats. Plastic straws do not degrade naturally and can be quite toxic to marine life. In fact, by the year 2050 there will be more plastic in the ocean than fish. Plastic does not degrade easily. Scientists at the the UGA New Materials Institute conducted a new study that discovered microplastics particles smaller than dust or powdered sugar inside baby sea turtles. All the turtles examined in the extensive studies were found to have eaten plastic. These baby sea turtles also were dying due to ingested plastic pollution that threatens the species’ survival. Without making any changes, it is projected that by 2050, 99% of all sea bird species will have ingested plastic. Plastic remnants and particles appear everywhere. Rsearch has shown plastic in sea salt, 94% of U.S. tap water and shellfish. How can this problem be remedied and also prevented from happening in the first place? The answer lies with the product design itself. Using a product that is made of recyclable, biodegradable material is important, especially given the proliferation of use. Secondly, for the existing plastics already polluting lands, oceans, lakes, rivers and their shores, there needs to be a method to collecting the existing waste and recycling them as best as possible. Prevention of future waste is essential as well. The EU Parliament recently banned the use of single-use plastics in a landmark decision. Bringing attention to single use products immediately brings awareness of their damage to the environment. This will need to extend to other non-recyclable plastic waste as well. What can you do for your own business or in your personal life? You can make a choice to not use single use products at your business or at home, as well as to recycle plastics you do use. The New Plastics Economy: Rethinking the future of plastics offers some solutions. This initiative offers a vision for global economies where plastic is never wasted. Download the full report via the Ellen MacArthur Foundation here.